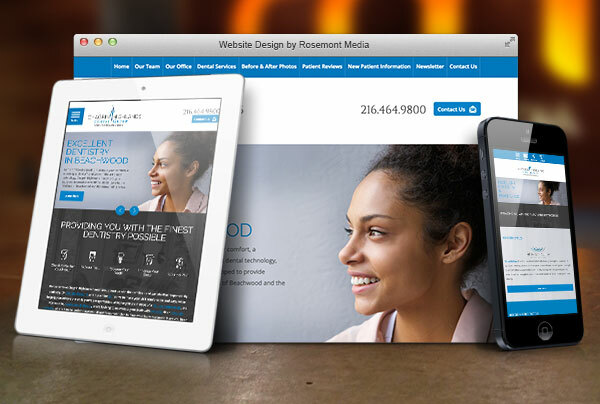 With the goal of creating an informative, easy-to-use online resource, Dr. Douglas Desatnik, a dentist in Cleveland, recently worked with Rosemont Media for the development of his dental website design. This new site for Chagrin Dental Highlands Group acts as comprehensive tool for those looking for information about dental treatments. Visitors can find details about the practice, as well as in-depth procedural content, all displayed in a responsive format. To help people navigate through the website, all content has been organized through a fixed drop-down menu bar at the top of the screen. Should a visitor be seeking procedural information, they can find all treatment options under the “Dental Services” tab. The unique design of this section displays relevant solutions to the patient based on what their specific needs entail (i.e. to maintain, fix, replace, or enhance their teeth). In addition to the clean structure of the site, visitors can benefit from the built-in responsiveness that will cause each page to automatically adjust to the user’s Internet device. This means that whether someone is visiting the website on their smartphone, tablet, or laptop, they can see the content in its entirety, without the frustration of needing to scroll left and right. With the recent launch of the Chagrin Dental Highlands Group website, patients can now find a wealth of original content, whether they’re interested in porcelain veneers, dental implants, or another solution. Each page has been optimized using the latest SEO strategies to improve the practice’s visibility online, allowing those searching for dental information to discover the site with more ease.